This week's forecast has been a challenge, to say the least. It's just been hard to nail down a coherent weather story. I feel like I have to walk into the weather center with fresh eyes and an open mind each day, as this complicated situation continues to play out. Of particular concern is the upcoming weekend. As we transition from summer to fall, I fear we'll also flip back to an unsettled, occasionally wet weather pattern. Again. Thursday morning is beginning with some spotty drizzle around New Jersey — the sky might "spit" on you at some point, and you might have to use your windshield wipers on the intermittent setting for a bit. Temperatures are little bit warmer as expected, due to higher humidity and thicker clouds, in the mid to upper 60s. I'm still saying that Thursday will feel like an early fall day — although that's admittedly not much of a stretch, since autumn begins Saturday night. High temperatures will be limited to about 70 to 75 degrees Thursday afternoon, a hair below normal for mid-September. (Normal high 75.) Skies will range from mostly cloudy for the first half of the day, to partly cloudy later on. A brisk southerly breeze will kick up Friday, potentially gusting over 20 mph. 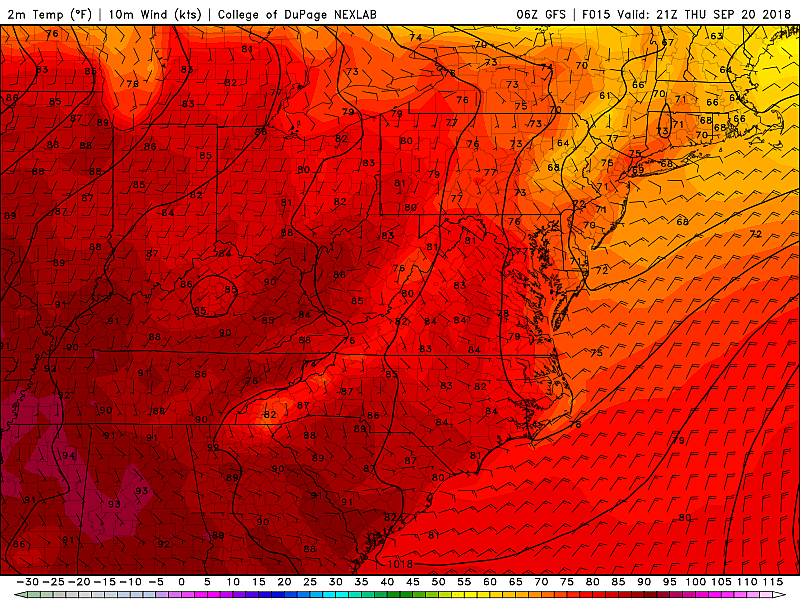 That will be a warming wind, pushing high temperatures back into the upper 70s to around 80 degrees. I think clouds will still win the sky, but it should be a decent day. Probably dry during the day. However, Friday night, an approaching cold front will drag scattered showers and thunderstorms close to New Jersey. Timing is very important here. If storms arrive in northwestern New Jersey before sunset (around 7 p.m.) they could be strong or severe. 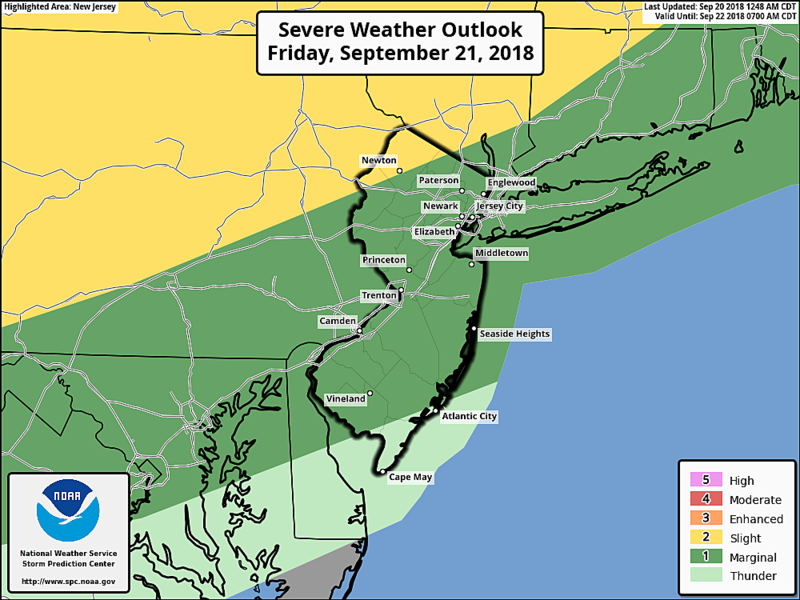 (I'm actually quite surprised the Storm Prediction Center painted most of New Jersey in a "marginal risk" for severe weather Friday night.) After sunset, I believe any storms will fizzle quickly. That front — the leading edge of a cooler, drier air mass — will make it at least halfway through the state on Saturday before stalling and washing out. Or there's a chance it stalls south of New Jersey. The difference between those two solutions is the difference between a mostly dry and mostly wet weekend. Still lots of uncertainty in this forecast. I'm thinking a few showers are a good bet for Saturday. But the day looks mostly dry, albeit mostly cloudy. High temperatures will hold steady, between about 75 and 80 degrees. The Vernal Equinox, the start of Autumn, will occur at 9:54 p.m. Saturday. Sunday is a huge question mark. Depending on the location of that "stuck" front, we could have periods of steady rain passing through part (or all) of New Jersey. Wet weather is not a guarantee, but it could make for a soggy finish to the first full day of fall. An on-shore flow (i.e. easterly wind) will probably keep skies grey and wet through early next week.